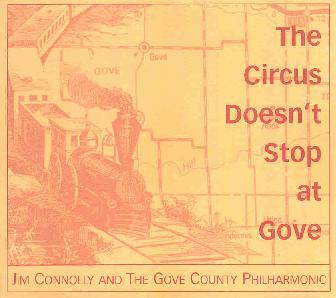 Jim Connolly And The Gove County Philharmonic - "The Circus Doesn't Stop At Gove"
This isn't what we typically receive here at Aural Innovations. But as an avid watcher of the American Movie Classics and Turner Classic Film channels, The Gove County Philharmonic turned out to be a good fun trip through many styles ranging from the good-time circus feel of the CD's title, to the modern musical circa Gene Kelly, and on to Kurt Weill and a host of others. But there's also a modern classical, even avant-garde, element that runs through some of the tracks. Imagine the Kronos Quartet with expanded instrumentation. And speaking of instrumentation, the band consists of Gilles Apap and Sally Barr on violin, Kirsten Monke on viola, Ron McCarley on clarinet, Jeff Kaiser on trumpet, Jim Bement on accordian, Bruce Bigenho on piano, and Jim Connolly on bass. Some tracks, like "Yes, I've Been To Gove", "Tar Dance", and "For Maggie" are like old romantic cabaret tunes. I especially liked "Tar Dance", a light romantic piano and standup bass piece that has a lounge jazz feel but also some classical influences. "House Of Cards" and "The Circus Doesn't Stop At Gove" are the tunes that most portray the circus of the album's title. "House Of Cards" opens with all musicians blaring their instruments before settling into the structured portion of the tune. The music is delightfully playful and conjured up images of An American In Paris, or any number of such classics in which theme, storytelling, and fun are all part of the music. The band is tight and precise, blasting out start/stop rhythms, and each instrument's timing is perfect. "The Circus Doesn't Stop At Gove" is indeed a moving circus, which is non-stop and with all the performers on stage. This playful, somewhat avant-garde, style is what I like most about the band. "Pinnocchio" and "1,000 MPH Train Wreck" were two of my favorite tracks. "Pinocchio" is a bass trio piece with guests accompanying Jim Connolly. It starts with a slow classical feel, but then segues into a more modern composition. The music is darker than anything else on this predominantly playful album and added to the modern classical feel of the composition are bits of jazz. "1,000 MPH Train Wreck" is a similar tune but with the full band. This track is also the longest taking nearly 10 minutes to evolve through a number of moods and themes. A good fun set of tunes and will likely appeal to you if you like American film musicals and modern classical. For more information you can visit the pfMENTUM web site. Contact via snail mail at pfMENTUM, PO Box 1653; Ventura, CA 93002.